Can Russia’s opposition come together to fight the Kremlin’s pension reform? The article originally appeared in OpenDemocracy-Russia & Beyond. While popular opinion is dead against the Russian government’s continued neoliberal line in social policy, opposition groups are competing for influence and electorate. Translated from the original Russian by Thomas Campbell. Now that the State Duma has passed the first reading of draft legislation reforming Russia’s pension system, we can speak confidently of a serious turn in state-society relations in Russia. For the first time in 15 years, the Russian government is risking a large-scale, unpopular reform. The government proposes radically raising the retirement age with almost no transition period. If it succeeds, the lives of millions of Russian citizens will be affected as early as next year. Despite the fact the reform is definitely falls in line with the government’s recent social policies, which have focused on reducing the budget deficit and lowering labour costs, it appears to be a clean break with the Putin regime’s established model for maintaining ideological hegemony. Until recently, passive grassroots support of the regime was underwritten by a conservative notion of Russia’s historic destiny, which united people and power in the face of external threats, while the decline in living standards was explained away as the inevitable consequence of the foreign political and economic pressure on Russia. Thus, even the government’s unpopular moves have been treated as manifestations of the “art of the possible” amidst a fraught international environment. The government’s reactive stance helped maintain the illusion of stability amidst actual economic decline and social degradation. This official mythology contrasts the stability and predictability of today with the 1990s, shock therapy, wide scale impoverishment and obsessive fear of the future. But for popular opinion, it is precisely the current pension reform that is bringing this ominous image of the past into the present. Voter support for Vladimir Putin, including during the presidential election in March, has primarily been fuelled by the expectation of stability. However, these expectations and the trust in the authorities they underpin have been invested in a reform which undermines the myth of stability. During his election campaign, Putin not only failed to mention plans to raise the retirement age. He did not present voters with a coherent vision of social policy at all. His main campaign speech was memorable thanks to its militaristic visuals and the threats he made to the west. Putin’s’ re-election was draped in an eternal present, in the status quo’s unquestionable advantage over all calls for change, which ultimately can only make things worse. Soon after the incumbent president’s triumph at the polls, the former finance minister (and Putin confidant) Alexey Kudrin published an article entitled “Three Tasks for Two Years”, in which he argued the next two years would be decisive for economic growth in Russia. According to Kudrin, Putin’s convincing election win had opened a window of opportunity for the structural reforms, including pension reforms, necessary to economic growth. His belief was fully shared by international financial institutions. Thus, in its report on its recent visit to Russia, the IMF recommended increasing the retirement age. As Putin’s fourth presidential term got underway, pension reform was, apparently, a point of consensus within the Russian political and financial elite. Putin’s high vote totals assured them large-scale popular protests would be unlikely. Thus, Prime Minister Dmitry Medvedev proposed raising the retirement age on 14 June, the same day the 2018 FIFA World Cup kicked off in Moscow. This glaring coincidence reveals the government’s initial strategy: use football fever to remove the pension reform from the headlines. We can assume the plan involved tabling and passing the law bill increasing the retirement age before Russian MPs adjourned for their summer holiday in July. However, the following week, more than a million people signed an online petition opposing the reform. The petition was launched by the Confederation of Labour of Russia (KTR), an independent trade unions association. As of 25 July, nearly 2.9 million people had signed the petition. 1 July was marked by a wave of protest rallies, attended by tens of thousands of people. On 18 July, significant protests against the proposed reform took place in Moscow and Petersburg. 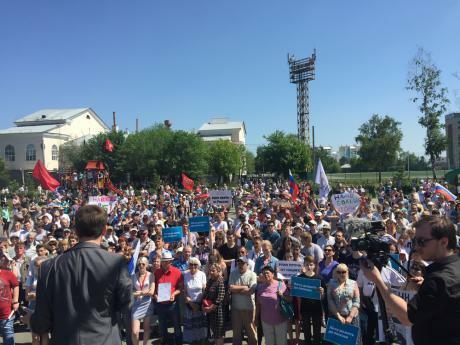 Anti-pension reform rallies have been held in 154 Russian cities to date. The propaganda counterattack undertaken by the authorities via state-controlled media was clearly ill prepared. Numerous journalists and alleged experts who had previously specialised in anti-western conspiracy theories and conservative “culture wars” set about trying to prove that raising the retirement age was the done thing in the developed world. The television news programs were chock-a-block with stories about happy senior citizens, ready to lead active lives and open to change. The down-in-the-mouth paternalism of the proposed reform’s critics was contrasted with the virtue of individual responsibility and the ability to compete and succeed. One MP from the ruling United Russia party called on Russians to leave their comfort zone. The regime’s new rhetoric, borrowed from the idiom of business seminars on personal growth and the psychology of winning, obviously struck an unpersuasive note in a country in which a third of the populace lives below the poverty line and feels like losers. Despite public opinion, the entire apparatus of Russia’s managed democracy, including federal ministers, regional governors and United Russia’s huge corps of MPs, was recruited to publicly support the proposed reform. This has produced a serious drop in the ruling party’s ratings and set off an overall crisis of trust in the regime. It is telling that Putin made his first public statement on the reform only on 20 July, the day after the State Duma approved the law bill in its first reading. In his trademark ambivalent manner, Putin admitted he did not like raising the retirement age, but the decision to raise it had been dictated by stark necessity and nothing else. At the same time, Putin noted he would listen to constructive criticism, and he claimed no final decision about the reform plan had yet been made. His comments were tantamount to the Kremlin’s launch of its backup plan. They had failed to push through the reform quickly and inconspicuously. The president would now function as focal point around which advocates of a golden mean could rally – a golden mean situated between the government’s excessively hasty advocates for raising the retirement age and the radical loudmouths on the streets, incapable of dialogue. The backup plan involves a second vote on the reform in the Duma, scheduled for late September. In the meantime, the four parliamentary parties and the loyalist Federation of Independent Trade Unions of Russia (FNPR) are likely to table amendments to the draft law. The proposed amendments will probably include concessions, such as a lengthening of the transition period, although the law bill’s basic parameters will remain fixed. Postponing discussion of the reform until autumn will also enable the rollout of a more persuasive propaganda campaign in which the reform could be portrayed as an inevitable response to the challenges of our time and a necessary condition for the country’s survival – meaning the tried-and-true motif of the country’s common destiny could be trotted out again. Nevertheless, the backup plan’s launch and postponement of passing the new law until autumn are clear indications that the regime is vulnerable on the issue of pension reform. On the other hand, the anti-pension reform movement’s main problem is a lack of organisational coherence and a common slate of demands. There are several campaigns against the reform running almost simultaneously. Capturing the high ground often seems to mean more to them than achieving the movement’s main goal of forcing the government to back down from its plan to raise the retirement age. The movement’s lack of unity provides the authorities with a propaganda trump card: they can claim the reform’s opponents are competing with each other for the chance to shine in the media limelight without suggesting constructive alternatives. A more important consequence is that potential supporters of the anti-reform movement are confused, and many of them could quickly become disillusioned with the movement if they feel like hostages to the ambitions of different political leaders. We must not forget that one of the principal elements of Russia’s current political system has been the cultivation of grassroots pessimism regarding all forms of public activism. It is impossible to change anything by protesting: such is the fatalistic mindset of the majority of Russian citizens, whose dissatisfaction with the planned pension reform has now been expressed in an obviously passive way. To win, the movement against raising the retirement age must transform itself into an effective coalition, the broadest coalition possible, a coalition capable of shattering faith in the regime’s central ideological linchpin. For the full article, please, visit OpenDemocracy-Russia.